And it’s also beautifully shot. 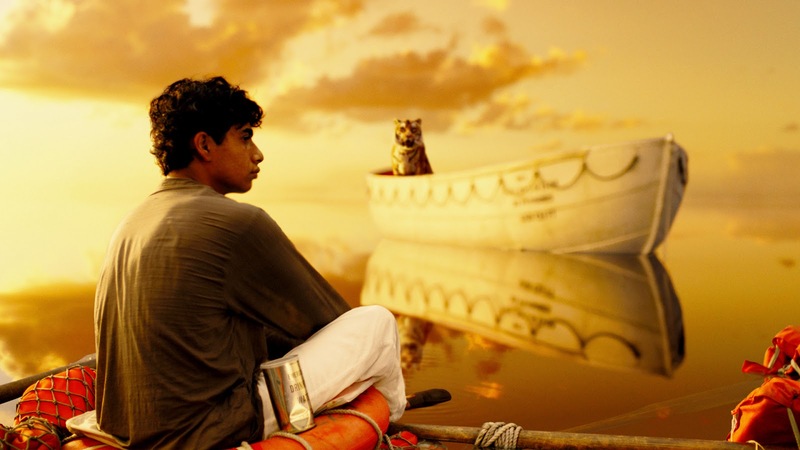 Life of Pi is a story about interactions, and it uses both animals and people to discuss interactions. The film’s opening credits, presented over shots of various exotic animals, highlight this: the titles and names bounce and slither along with the animals, even to the subtle extent of jiggling in tandem with the large nose of a proboscis monkey. The plot proves interaction to be a main theme when it follows the young Indian boy Pi on a journey that forces him to constantly and directly interact with the least likely candidate for any interaction: a Bengal tiger. Well, interaction any tiger would be pretty darn unlikely, but everyone enjoys calling this one a Bengal one, so I figured I would too. 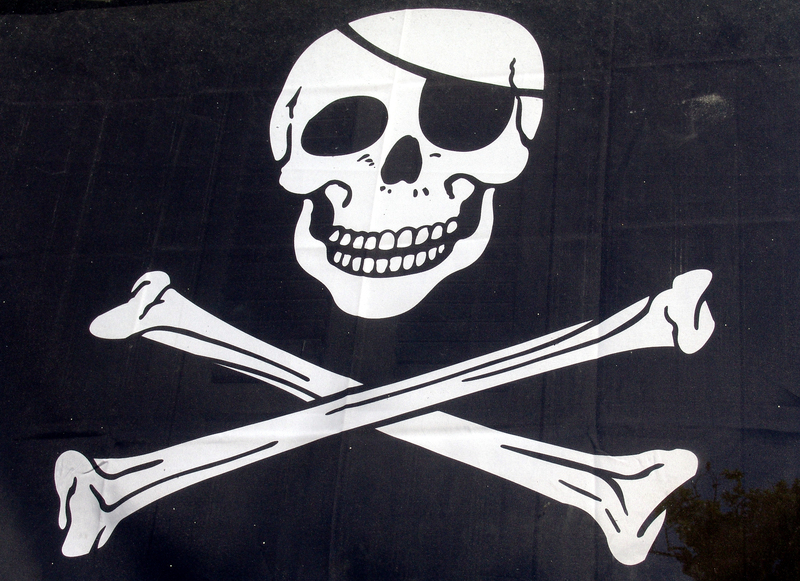 Before the shipwreck, however, the theme is still clear: Pi, a Hindi Christian Muslim, clashes with his non-believing father over the nature of the world and the nature of animals. Pi claims to see emotions in their tiger’s eyes, while the father claims that Pi merely sees his own emotions reflected in a rebuffing gaze. Pi returns to this argument near the film’s end, saying that he can’t prove that his father is wrong. Yet Pi’s relationship with the tiger does prove that they are capable of working together, as the film shows in the final shot of the film – the tiger chooses not to look back at Pi when they finally part, showing that their connection is not severed. The film’s twist ending further expounds on the theme. By tying animals and humans together, Pi retroactively breaks down barriers of understanding about the importance of communication between the two. When humans and animals can’t interact with each other, they kill each other. When they do interact, they see each other as beings, even though they still don’t have to agree with each other. Pi never tames the tiger, but the tiger never eats him. In a similar manner, Pi’s religions and even his stories may not agree with each other, but they all interact perfectly well. The whole affair is refreshingly non-pedantic and subtle. Crash could probably learn a thing or two. 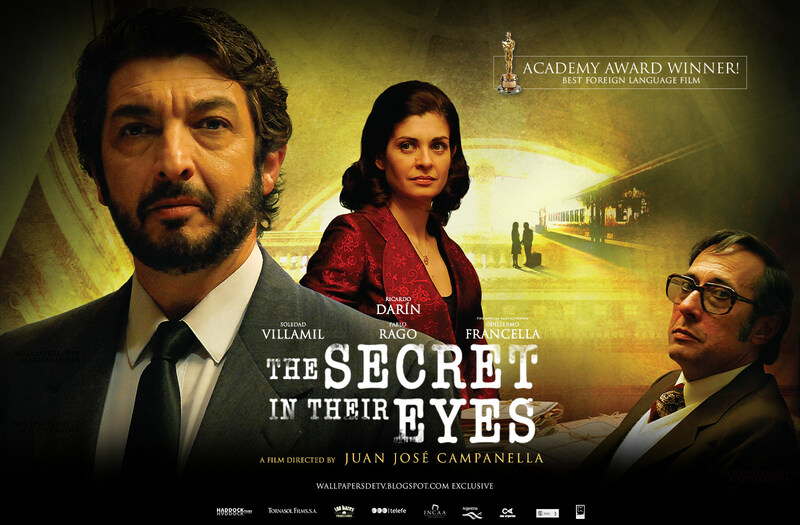 The Secrets in Their Eyes is a well-constructed film with strong drama and an ending ultimately both satisfying and disturbing. The filmography consistently uses tricks that are fun but not showy: when the protagonist, Espósito, meets his love interest, Irene, the camera stays on his gaze in order to show his newfound passion even while another character is introduced in the unfocused background; later, Espósito’s drunken friend isn’t given a chance to speak a word for an entire scene as Espósito convinces him to help in exchange for booze money; and form cuts are frequent, since the film allows 2000s-era sounds such as a kettle whistle or a ringing phone to pull the protagonist from his memories of the 70s into the present day. One technique strongly relied upon throughout the film is the use of shots close to characters’ faces. Since it’s a crime drama, the film has many scenes of suspense, and close-ups bring the audience so intimately into the emotion that the film is almost too awkward to watch. This feeling of unease is heightened by many shots that don’t even show the entire face of the character they feature. In one scene in which Espósito is taunted by a rival, neither of their faces is fully visible for a series of shots, during which Espósito is quietly insulted. The film is comfortable with objects so far into the foreground that they are just blurry blobs, even when said blobs take up nearly half the screen. Sometimes these objects simply serve to increase the tension and intimacy of a scene, but other times they are meaningful themselves: near the end of the film, Espósito spots a picture frame depicted in the extreme foreground for several shots as the man contemplates it before walking up to examine it closer. I felt the film’s entire two-hour length; it was still engaging throughout, but I might get bored on a second viewing, as much of it is atmospheric, and I’ll know what emotional shifts are coming up if I rewatch it. The question of whether justice will be served is gripping, however, and the ending fully justifies any other issues the film has. It stuck with me for a while after the film had ended. Modern Times begins as a whimsical diatribe against the dehumanizing quality to the mechanicalized ‘modern times’ of the 1930s. Chaplin’s antics are set first in a sadly automated factory and then in a series of jobs, each of which he fails to keep for one reason or another. 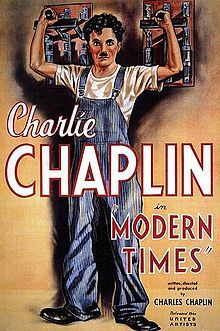 The concept of a loser protagonist is pretty common in slapstick comedies, but when stuck into the Great Depression, it works better than normal: Chaplin’s nameless character could be anyone having a tough time finding work. The movie isn’t subtle. After the opening shot’s joke about sheeple, the film mocks the modern era even in the dialogue cards. One reads “Time marches on into the late afternoon,” taking the optimistic concept of humanity marching forward in a constant improvement, and turning it into a phrase about the mundane. The dismal effects of the depression are unflinchingly addressed in the narrative, as kids forage for food, and laid-off workers turn to robbery, but always end happily, with no permanent damage falling on anyone whether they deserve it or not. Chaplin himself even realizes the dehumanization of his world. In my favorite scene, Chaplin hilariously uses the factory’s ever-moving factory line in his own favor: when being chased by factory workers, he turns on a conveyer belt, forcing them away from him and back to the demands of the machinery. In doing so, Chaplin sees the reality of a senselessness world of menial jobs, and makes the best of it. That seems to be the point of the entire movie, too. Chaplin never seems very fazed by his problems, but never fails to acknowledge them, either. In the end, as he walks down a road with his creepily young love interest beside him, he remains positive despite his omnipresent lack of an occupation. He’s an example to those who find themselves in a similar situation of economic independence. If Charlie Chaplain can stay happy, anyone can. 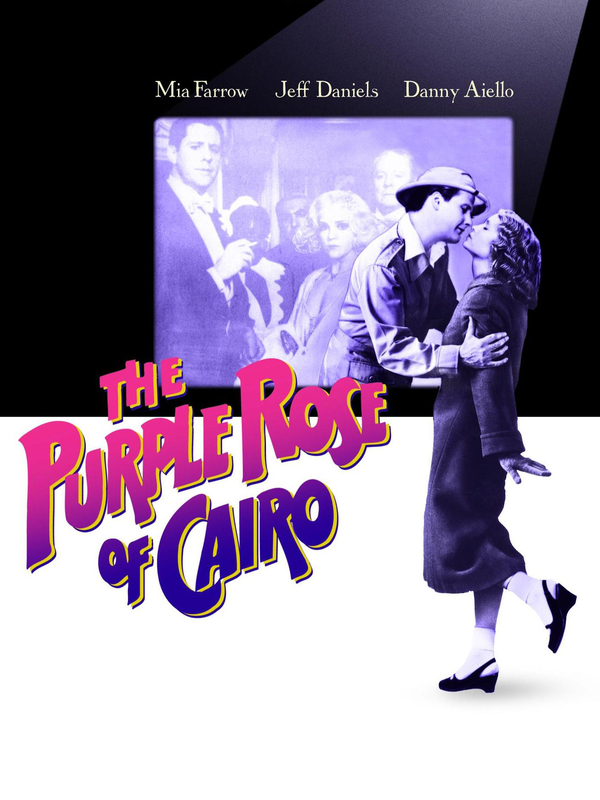 Woody Allen’s The Purple Rose of Cairo tells a story of two different worlds: reality, as depicted by a depressing New Jersey society of loafers and liars, and fantasy, shown in the titular film-within-a-film, which encases a world of freedom and happy endings. In the end, neither is revealed to be anything more than what it appeared to be, something that mildly bugged me, as I was second-guessing the film and hoped to see an interesting twist. Also, I dislike stories that end unfairly for the heroine. The film’s style is happy and innocent, in a (no doubt) devilish attempt on the part of Woody to lure the audience into a false sense of security. Because the main character Cecilia, even when fighting her abusive husband, handles the entirety of her experiences with a sense of aplomb, I as an audience member felt that nothing would go seriously wrong in the end, at least for her. Even her husband’s textbook-abusive “I still love you” claims kept him humanized, and not a total monster. (Although maybe that’s darker, on second thought.) Numerous sweet scenes, like the shop in which Cecilia plays her ukulele and Gil sings a ditty, together with every scene that Tom is in, convinced me that the movie overall was pretty innocuous. Now, I’m okay with sad endings, and even bittersweet ones can be fun, although they’re usually tougher to deal with than completely sad endings. But when I’ve been convinced that a movie will have a decently happy ending, and it pulls the rug out from under me, I can’t help but be awed at its ability to annoy me at the eleventh hour. When Cecilia gets swindled by Gil, it became clear that the movie is pretty static: she’ll always have a terrible life, and will always escape it with fantasies about a life in which freedom – travels to Cairo, swank cities, and singers going on about not caring about tomorrow – will always be available. My final verdict would be complete annoyance at Woody’s pessimism wrapped in empty happiness if he didn’t characterize everyone so well. No one is a stock character, as even Gil shows remorse on his plane trip at the end, and random moviegoers have different opinions on the events they witness. My favorite scene was when Gil and Tom both react in shock at the possibility that they aren’t the best character in the movie. They’re from opposing worlds, but the same ego slipped into both, a tiny detail that fleshes them out and an example of the redeeming fun of the storyline. In which I am the Emperor in a spoof of Star Wars. This one has a lot of in-jokes about my college, so all of you folks out there might not appreciate it as much as we do, but it should still be entertaining. Fun fact: Since both this film and Poetic Justice aired during my college’s Film Fest, I was able to play an evil cackling villain who shows up for the final battle to get a dramatic death in not one, but two different films. My award-winning student film, in which a team of heroic poets tackle the Grammar Nazi menace.